2018 is the year of the FIFA World Cup™ with Hublot as the official timekeeper. To mark this special moment Hublot is celebrating football with a powerful universal message on the values that drive a champion. 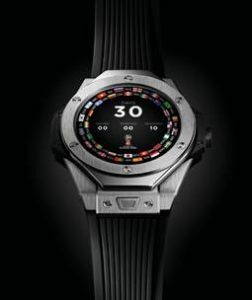 Hublot counts legends including Pelé, Maradona, Jose Mourinho and Usain Bolt as friends and brand ambassadors. They embody success with their strong mind-set and inspiring performances. As champions they convey the message of “How to become a champion!”. The campaign is brought to life through 13 visuals of football legends combined with motivational quotes. 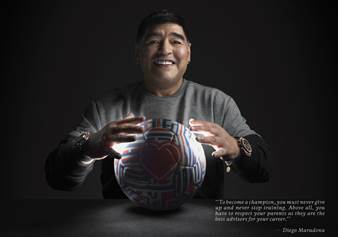 With 30 days to go until the FIFA World Cup starts, legends like Pelé and Maradona share their thoughts on what made them into champions. This unique project brings together celebrities who were not expecting to meet each together – it is an Art of Fusion moment for which Hublot is known. The campaign unites players, coaches and legends who all share a love for football. The campaign features a team of 13 living legends including Pelé, Diego Maradona, coach José Mourinho, Usain Bolt, the fastest man in the world and a football fan, international referee Bjorn Kuipers, Swiss international Xherdan Shaqiri, footballing icons David Trezeguet, Marcel Desailly and Alexei Smertin, and managers of the national teams playing at the FIFA World Cup 2018™ Stanislav Cherchesov (Russia), Gareth Southgate (England), Julen Lopetegui (Spain), Didier Deschamps (France) and Hervé Renard (Morocco). This is not the first time the watchmaker has brought together the biggest names in football. In 2014, for the World Cup in Brazil, Hublot ran a campaign bringing together football stars. Once again, Hublot confirms its vision—unique, different and new. The watchmaking brand opens the doors into the mindset of the greatest sportsmen and strategists of all time to reveal the tactics and exploits behind their goals and victories. It is also a moment to discover the friends of the brand. The campaign is a combination of powerful words and images; the portrait series reveal the distinctive character of each personality. 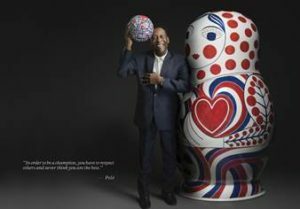 Included in the portraits is the watchmaking symbol of the 21st World Cup – the emblematic Matriochka or the Hublot football, both of which were created and painted by the contemporary Russian artist Andrey Bartenev. “To become a champion, you must never give up or stop practicing.